With so many tooth-whitening products crowding drug store shelves, consumers are bound to overuse them in search of that sparkling white smile. Dentist Nancy Rosen talked to The Early Show co-anchor Hannah Storm to end the confusion about choosing the right product and using it safely. "There are so many people looking for the bright white smile," Dr. Rosen says. "But they're overusing the products and they're not reading and following the instructions." So how do you know if we've bleached too much? "A couple of signs are that people's teeth and gums can become very sensitive," Dr. Rosen says. "Another sign is they'll lose the natural luster of their teeth and the edges of their teeth can also become a bluish transparent color." Unfortunatelly, though the sensitivity is reversible, Dr. Rosen says, transperancy is not. The rule of thumb is to bleach every six months to a year, she says. As for over-the-counter products, she says they work well. "It's not like going to a dental office to have your teeth bleached," she says. 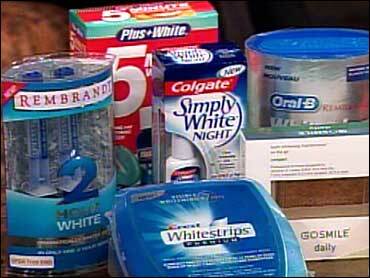 "But for over-the-counter products, if they're used properly, they will whiten your teeth. The key is to have clean teeth, follow the instructions and always, Dr. Rosen says, "consult your dentist to see which product he or she would recommend." For example, she explains, if you have crooked teeth, the strips may not touch every single tooth. Then you would bleach unevenly, so in this case you would want to use a scrubbing ampule. Just beware of over-the-counter trays. Dr. Rosen explains, "The trays you get over the counter work well, but not all mouths are the same. If you go to your dental office or your dentist, they can make a tray specifically for your mouth. With over-the-counter trays, you can have a lot of uneven bleaching and you can have sensitivity if you use those types of trays." As for whitening toothpaste, Dr. Rosen says it work well to maintain whitening, but she notes it will not whiten teeth. Also Dr. Rosen says, over-the-counter products would not work for people who have certain types of stain on their teeth, ie. tetracycline staining. People with crowns, caps or veneers, should go to the dentist to have their teeth whiten, as well. And if someone has broken teeth or loose/fractured fillings or cavities should not bleach because this will make the tooth very sensitive. "You definitely want to have those problems taken care of before you do any type of bleaching," she says. As for how much it cost to have teeth whitened professionally, Dr. Rosen says, "It can range from 500 to $1,000. And that would be twice a year." Look for the ADA Seal of approval on fluoride toothpaste, toothbrushes, floss, interdental cleaners, oral irrigators, mouth rinses and other oral hygiene products. The ADA Seal on a product is your assurance that it has met ADA criteria for safety and effectiveness. Replace your toothbrush every three or four months, or sooner if the bristles become frayed. A worn toothbrush will not do a good job of cleaning your teeth. Children's toothbrushes often need replacing more frequently than adults because they can wear out sooner.